Vancouver endeavors to be the greenest city in the world, and the city is attempting to create a new (theoretically) stricter building policy towards that end. Vancouver recently introduced a new Zero Emissions Building Plan in a 62 page report to council which they hope will become a zero emissions building code. It’s objective is to reduce emissions from new buildings by 90% by 2025 (compared to 2007), and have zero emissions in all new buildings by 2030. We will examine this plan in a 4 part series. Part 2- The district energy part of the plan. Part 3- The zero emissions part of the plan. Part 4- The Passive House part of the plan. According to their own data, from 2007 to 2015 the city reduced their energy usage in buildings (through use of building codes etc) by 30% in new buildings and by 20% overall. In simple math that means if the City kept their current strategy their new buildings emissions will have been reduced by 55%. That's 35% off their new target to be fair but any strategy that is giving you a 2.5% yearly reduction would be a strategy one would build upon rather than abandon. Yet that is what City staff are proposing within the new zero emissions plan. Vancouver’s current sustainable building standard for new buildings (requiring rezoning) is LEED Gold and ASHRAE 90.1-2010 for everything else that isn't a single family home. The LEED Gold requirement requires 22% better than ASHRAE 90.1-2010 which would suggest that if the City simply applied the rezoning policy to non-rezoning projects they might be well on their way to making up their 35% shortfall with their current plan of a 90% reduction by 2025. Both the USGBC who administers LEED and their partners at ASHRAE are constantly improving energy code standards as they have a similar goal as the City of Vancouver to have zero emissions buildings. The CaGBC also recently released their Zero Carbon Building Framework. The energy content of the gasoline used by the typical office commuter each year is comparable to the energy used by his or her share of the building where he or she works. Which means that having good bicycle infrastructure in a building can have an greater impact on carbon reduction in the city of Vancouver than many building energy efficiency strategies. 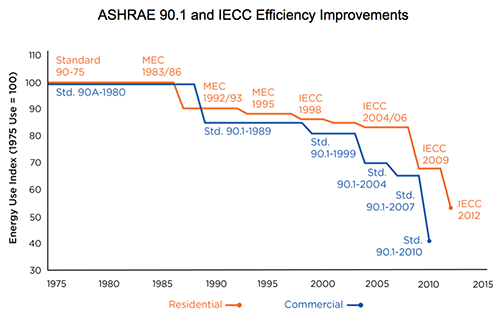 ASHRAE 90.1 for those who don't know is a building standard that has been around since the 1970's. Our national energy code is modeled on ASHRAE 90.1 and the standard covers a very wide variety of building types from residential, healthcare to super energy consumptive data centers. With the new Zero Emissions Building Plan, city staff appear to be pushing for Passive House or other building envelope standard to replace LEED for the city’s building standard by 2018 while simultaneously pushing district energy (or neighbourhood utilities as they call it) in new and existing building areas. The two largest problems with the City of Vancouver plan is that the city is pushing district energy at various levels (less efficient that building level systems) while the cost of natural gas is at an historic low. The one problem makes it technically more difficult to reduce carbon at a city level while the other makes it financially more difficult. District energy makes meeting LEED and Passive House standards more difficult. The main reason is that both rating systems account for the inefficiency of district energy systems (line loss, pumping energy, etc) as they are both focused on more than just building efficiency. LEED accounts for it by making the baseline building cost the same as the proposed new building. City staff currently let people skirt this issue on code compliance models by not forcing them be the same value, thus allowing a design that would not qualify under LEED standards to pass at the city level so as to ensure that district energy is not seen as a penalty to developers who currently also have to pursue LEED Gold. Passive House accounts for the inefficiency of district systems by using source energy as their baseline for their energy intensity target. This means that you must also account for line loss, pump energy, and all the other factors associated with energy that is not produced on site. Should the city move away from LEED (not recommended) to Passive House the same allowance for district energy being used today would also be needed for Passive House buildings to meet their standard. A wood based district energy systems would have to also ignore the embodied carbon associated with the diesel trucks, diesel power chain saws and other gasoline systems that would be used to get the wood to the neighbourhood utilities. Please also note that wood burning systems (because wood doesn’t burn as cleanly as gas) require frequent flush outs (i.e. running gas through the system to burn off wood waste) in order to continue running effectively. Combine this with the current price difference between electricity and gas and it will make it financially difficult to convince stratas and public entities to make the fuel switch that would create the quickest carbon reductions in buildings. The current price of residential electricity is currently around 9 cents kWh while the price of natural gas is only 3 cents a kWh. 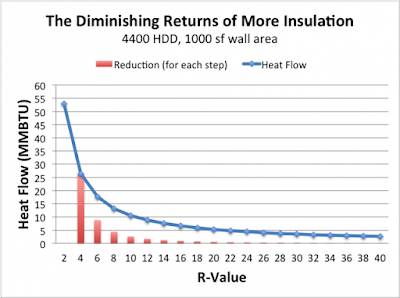 Should the city enforce a code which is merely GHG based without accounting for other factors, developers will simply switch from more efficient gas heating to less efficient electric heating while also passing off the additional operating costs to home buyers. Please tune in next week for more detailed discussion of district energy systems as they apply to GHG reduction and the City of Vancouver's Zero Emissions Plan.